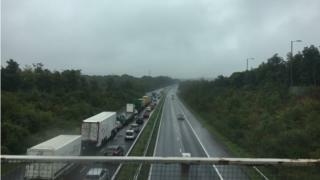 The M4 had to shut in both directions for almost nine hours after a lorry crash. The road was affected between junctions 46 and 45 near Swansea after the vehicle crossed the central reservation on Monday at about 17:15 BST. It remained closed for recovery work and repairs on the central reservation barrier and one lane in each direction reopened at about 02:00 on Tuesday. South Wales Police said one person suffered non life-threatening injuries. The closures affected traffic on Tuesday, with motorists stuck in queues in both directions. One lane in each direction is still closed for repairs, with Traffic Wales estimating they will not reopen until at least 15:30 on Wednesday.